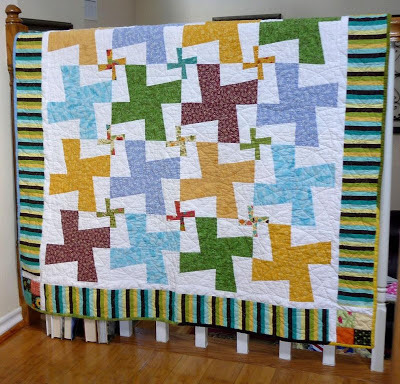 The Whirligig quilt is done! Since I'm visiting my parents this weekend I took to opportunity to get some photos of it with their pretty staircase and good windows. Wilson is notably absent. Traveling in the car is very stressful for him, so he stays home on short trips like these. I drew out this pattern and developed all the cut requirements and measurements for myself. I added the miniature whirligigs to use up some of the fabrics I got in my Moda Sampler Pack for Christmas. They are from the 'Frolic' line by Sandy Gervais. The rest of the fabrics, except for the border, came from stash. I tried hard to keep it gender neutral, but I was definitely thinking of a little girl when I made it and the Frolic fabric has some little flowers on it. Still, I think it could work for a little boy, too. The backing is flannel, corduroy, and linen. I made a scrappy binding from the leftover backing. I love the way the corduroy binding feels. That is definitely one of my favorite fabrics. This is the densest quilting I have ever done and also the first curved line quilting. It really made it crinkle up beautifully. The body has overlapping circles that are almost as big as the blocks (about 9 inches) and the border has a celtic inspired design I worked out and traced onto the fabric using cardboard cut from a cereal box as a template. This is a toddler bed sized quilt, approximately 50" x 60". I don't know any toddlers (who I want to give it to, anyway) or any expectant mothers. The idea for it just got under my skin and I had to try it to see the design on paper become a quilt. This is definitely my favorite quilt I have made so far and the first that I feel good enough about the quality to be willing to sell it to someone. I'm happy to enjoy looking at it until the right person has a baby and I can pass it along. Thank you! 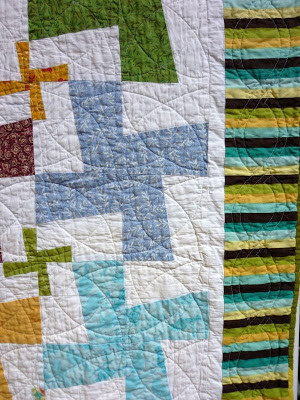 I'd love to see your quilt as you work on it, too.